ILRI former director general Carlos Seré at an ILRI ‘liveSTOCK Exchange’ event held in Nov 2011 on ILRI’s campus in Addis Ababa, Ethiopia, to reflect on the ‘Seré legacy’ and ways forward for the institute under ILRI’s new director general, Jimmy Smith (photo credit: ILRI/Zerihun Sewunet). On 9 and 10 November 2011, the ILRI Board of Trustees hosted a 2‐day ‘liveSTOCK Exchange’ to discuss and reflect on livestock research for development. During the workshop, Carlos Seré, former director general of ILRI, reflected on his tenure; the following is a transcript of his talk. Thanks for the invitation to reflect on the International Livestock Research Institute (ILRI), particularly after having some time away from the day‐to‐day management of ILRI and a bit of time with the International Fund for Agricultural Research (IFAD), where issues are related but perspectives are somewhat different. In today’s knowledge‐sharing terminology, these two days are a sort of ‘after action report’, hopefully a useful input into ILRI’s upcoming strategic planning process. In some ways ILRI is very different from what it was 10 years ago; in other ways, it still is very much the same. At the time of my interview for the job here on this campus in March 2001, the central question I had to address was to define the future niche of ILRI. The question of how ILRI activities add up and produce impact was at the core of that conversation. I just read some notes I wrote after travelling to visit some ILRI donors and stakeholders with Ralph von Kaufmann in September 2001 before joining ILRI. Many of the issues raised by stakeholders on that trip later influenced our strategy produced in 2002. These issues included explicitly addressing poverty, the need for impact on the ground via partnerships, our relationships with the national agricultural research systems of developing countries (NARS), the role of monogastric animals in our research agenda, the growing importance of global animal health issues, and so on. The United Nations Millennium Development Goals (MDGs) had just been defined and were central to development thinking. Our strategy, using livestock as a pathway out of poverty, aligned clearly with the MDGs, and I would claim we did it before many other agricultural research centres. Livestock being both an output and an asset for poor people made farm animals particularly suitable instruments for addressing poverty. The world has changed significantly over the last decade. Emerging economies are becoming the motor of global economic growth and seeking a more active role in international knowledge transfers (South‐South cooperation), private‐sector engagement is growing, public‐private partnerships are seen as key, the importance of remittances for the poor is growing and the diaspora is increasing its engagement in development affairs. In addition, donor coordination, sharing the development burden more widely among all parties and country ownership of development strategies are becoming increasingly important. And there is the rise of other issues regarding taxation, governance and corruption, as well as new regional initiatives such as CAADP, BRIC and the G20. The 2008 food price crisis, the Arab Spring and the Horn of Africa drought crisis have brought back agriculture, food and nutrition to the international agenda, but with very different context and policy formulation. As far as I could read in some of the documents produced by the task force for the merger of the International Livestock Centre for Africa (ILCA) and the International Laboratory for Research on Animal Diseases (ILRAD) in ILRI in 1994, the thinking at the time was still very much dominated by biophysical disciplinary research and some eco‐regional integration. To some extent, ILRI was expected to produce the basic breakthroughs in livestock genetics, health and nutrition, which were to be integrated by eco‐regional centres working with NARS. When I arrived in January 2002, the ILCA–ILRAD merger was still an issue. By now, even here in Addis people increasingly talk about ILRI and not ILCA. The focus of ILRI then was largely research; staff members were organized in disciplinary teams in Addis and Nairobi and in regional programs in the East African Highlands, West Africa and Southeast Asia, which operated independently of the disciplinary programs. The ‘livestock revolution’ paper by Chris Delgado and Simeon Ehui and others had a strong influence on the thinking over the last decade. We moved from disciplinary programs to issue‐driven themes and we created a geographic structure where all activities are coordinated by themes. We were seeking a flatter structure, larger interdisciplinary groups, and a more flexible structure evolving with the agenda. To some extent, this worked. We created an innovation theme, morphed it into a smaller team, created a service to other themes around innovation, explored creating a small consulting arm (LRG), and established Biosciences eastern and central Africa (BecA) as a platform. We experimented a lot, maybe too much. An external program and management review (EPMR) led by Lindsay Falvey in 2006 endorsed the theme‐driven organizational structure, stressed the importance of tackling poverty, was not too enthusiastic about our focus on markets, asked for greater engagement in Asia, supported a strong systems‐based strategy but felt uncomfortable about our engagement in programs like our ‘Improving Productivity and Market Success of Ethiopian farmers (IPMS) project, considering them too far down the development path. This was the zeitgeist then, strongly driven by the Science Council of the time. Our long‐term research focused on vaccines against East Coast fever and on dairy policies, livestock‐wildlife interactions, food‐feed crops and poverty analyses. A range of new topics were taken on, such as vulnerability and risk management, climate change, innovation systems work, food safety, emerging diseases, contagious bovine pleuro‐pneumonia (CBPP), tweaking of the infection‐and‐treatment (ITM) immunization method for East Coast fever and gender issues. We reduced or discontinued a number of topics such as rumen manipulation, methane emissions from specific diets, development of a vaccine against African animal trypanosomosis and ex‐ante impact assessments. We got some bad marks from the CGIAR Standing Panel on Impact Assessment (SPIA) and the World Bank performance indicators system for the latter. Over time we increasingly acknowledged the close interaction between the components of agricultural systems, thus limiting the impact of any individual intervention (no silver bullets). We increased our efforts to engage with real production systems in such initiatives as IPMS and an East African Dairy Development (EADD) project. These experiences led to a greater emphasis on working in value chains and to bringing managerial skills into the initiatives. The evolving skill set required by ILRI demanded our investing in new kinds of talent; originally, we just wanted good scientists; now we knew we needed those with soft skills such as managing partnerships, fund raising, communications, and teamwork in addition to the good science. Formerly, we recruited staff mostly from the market; increasingly we’ve had to develop and mentor staff in house. We have faced the challenge of working to increase our gender balance and geographic diversity in a competitive environment with many new actors. Attracting the right set of talents to the institute and retaining and growing them has become more and more challenging. ILRI embarked early on in the transition from a research to an innovation paradigm. This was probably one of the more fundamental changes introduced in ILRI over the last decade. We were early among the CGIAR centres to do this. This culture shift is reflected now in both the ‘what’ we do and the ‘how’ we do it. Innovation platforms, value chain work, knowledge fairs, the evolution of our annual planning meetings are all part of this paradigm shift. In 2001, ILRI didn’t have an intranet. Coming from working for the International Development Research Centre (IDRC), I had seen the power of ICTs for development. This was particularly critical for ILRI with its staff distributed across two main campuses and several other locations. Today we have a range of ways in which we communicate within ILRI and with the outside world. We have fully embarked in the web 2.0 world of social media. We have a successful partnership with Burness Communications, through which we have managed to engage important media such as the Economist, the Guardian, Der Spiegel, BBC News, etc. We are among the leaders in the CGIAR and among research organizations in this field, but the territory is now highly contested and will require attention and resources to continue to maintain this position. The recent review of communications has provided us valuable pointers for the future. Internal communications is an area where I feel we have not been up to the task. Particularly at a time when we were undergoing significant changes in our business model, we should have done a lot more face‐to‐face interaction in small groups. I was reminded of this by a message on one of the pin boards stating that I had not personally talked to him or her during my tenure. I am sure many more staff members feel that way, particularly those working outside Nairobi and Addis. I apologize for that. Capacity building has always played second fiddle to research in the CGIAR. But it is highly demanded by our developing‐country partners and it is now back on the agenda due to the realization that it is critical to achieving impact at scale. We strengthened the function of capacity building at ILRI and had many discussions but haven’t really created the right incentive structure for staff to see capacity building for innovation and research as the ultimate way in which we have impact. This tension has been particularly acute in BecA and the development of its plans for the future. We have gradually expanded our regional presence in Asia, southern Africa and West Africa. We have a genetics laboratory in China. We faced the challenge of doing this at a time of declining core funding. This is the ‘chicken and egg’ problem, and we will need to find new approaches to tackle this. A challenge for our organization is having the largest infrastructure in the CGIAR: the two campuses and the changing demands for delivering ILRI’s work from labs to farmers’ fields. Our infrastructure included the Debre Zeit Research Station in Ethiopia, the BecA labs in Nairobi, and our infrastructure at our offices in the International Institute for Tropical Agriculture (IITA), in Nigeria, and the International Crops Research Institute for the Semi‐Arid Tropics (ICRISAT), in India. We made efforts to transform ILRI infrastructure into platforms for the CGIAR at large, and attempted (unsuccessfully) to bring the CGIAR Consortium headquarters to East Africa. A central topic for the future is the fractured nature of our community, a message we got from the Global Conference on Agricultural Research for Development (GCARD). Do we have too many partnerships? We developed a partnership strategy but didn’t put enough effort into implementing it. Execution is the real challenge in all these change processes. Regarding our work with the private sector, we made initial efforts to market diagnostics with SVANOVA, in Sweden, work on East Coast fever with Merial, on feeds with NOVUS and BASF, value chain work planned, our Index‐Based Livestock Insurance project (IBLI). We have reached just initial stages but expect to grow these partnerships significantly, but this will demand different ways of working. To ensure sustainability, governments or the private sector need to take up innovations, but many of our partners are suspicious of the private sector, and the public sector in most cases has neither the human nor the financial resources to deliver the services sustainably. Among the lessons I have learnt are the following. • The need for clarity of vision and for staff to relate to the mission: everyone needs to be able to connect the dots. • Bill Thorpe’s legacy of the three FFFs: Focus, Focus, Focus. • You have to take some calculated risks (that is, if you haven’t failed, you haven’t tried hard enough). • You can’t do it alone: No single organization controls the totality of a development process; impact is achieved only within partnerships. • Planning is easy; execution of plans is terribly difficult. • Change management initiatives require very serious management attention on top of the attention the day‐to‐day management of an organization needs; do a few of them and resource them properly. • Need for scaling up to have impact, and the implications of this for partnerships and capacity building. • The increasing importance of human resources: human resources is everybody’s business. (In the past, we had no HR director and HR reported to Finance rather than to the director general). • The growing importance of the efficiency agenda: in times of scarce funding everywhere, donors expect recipients to be at least as frugal and efficient as they are. We tend to have a very stereotyped view of the rural poor and we expect them to respond to generic interventions in technology, markets or policy. The reality is a lot more complex. Livelihoods are diversified, off‐farm incomes such as migration and remittances play key roles, sources of innovation are not just public agricultural research, entrepreneurship skills are important (as seen in our IPMS project), rural employment is increasingly a desired option (as shown in Patti Kristjanson’s work on pathways out of poverty), etc. This requires a much more complex set of policies and instruments—way beyond what livestock research is good at producing. This requires new arrangements, partners, to be successful. • CGIAR Research Program 3.7 (Livestock and Fish) working in a limited number of countries. This is a real dilemma for a system designed for global public goods. Increasingly, the CGIAR centres are establishing country programs. To thrive in a rapidly changing context, an organization needs to get signals from its environment and needs to react to these signals. In the private sector, the market sends these signals and organizations respond or rapidly disappear. Many well‐known brands of the past have disappeared. In the not‐for‐profit sector, the signals are a lot less clear and investors also have more difficulties in reading the signals. This context is changing for places like ILRI. Transparency of costs is increasing; the private sector and philanthropists are introducing clearer metrics. To stay competitive, ILRI needs to learn and change faster. Examples of our work to engage large‐scale policy processes include our research in the areas of one‐health, climate change and Rio +20, but at the same time we recognize that this is very contested territory, requiring heavily focused policy engagement. It is essential to decide clearly which battles to pick and how to work with partners in those battles. Getting the governance right for a public RforD organization may involve increasingly nested governance, e.g. for a value chain in a country, a steering committee of stakeholders from that country may be most appropriate, while for the global agenda, an existing board may function with a parallel effort of greater transparency and consultation via GCARD as well as many other virtual platforms. All the above is irrelevant if we cannot raise funds to execute our mission. Funding public goods is always difficult; funding public research for development is even more difficult. The days of the core funding to individual centres are gone. The project‐based funding has led to an atomization of the agenda. The future will hopefully be of program‐based funding, strategic partnerships with the private sector and with private philanthropists and increasingly the funds of governments themselves (Mexico‐CIMMYT deal is one example, the support by India to ICRISAT another). Crowd sourcing, intellectual property and consulting services may all play some role in specific settings. What is sure is that it will be a mix of several sources in most cases; it will come with more stringent conditions (as seen with private foundations); and it will require very lean and efficient organizations to thrive in an increasingly competitive environment. Strategy is an on‐going job, not a one‐off exercise, in a fast‐paced world; this is the most difficult task for a leader and his or her team: to deal with the external, messy, complex set of demands, trends, issues and opportunities and to distil clarity and direction for the organization. Having a strong cohesive team to jointly make these decisions is essential. Organizational effectiveness, delivering value for money, is a particular challenge for international not‐for‐profit organizations. There are no entitlements and public and private investors have a multiplicity of organizations to choose from. Livestock ‘goods’ and ‘bads’ are not going to go away from the global agenda soon. ILRI is the only international research centre comprehensively addressing livestock issues that can play a key role in helping mankind to deal with them. The nature of the questions the world cares about will constantly change. The future of ILRI will depend on your capacity to combine strategic long‐term thinking (science push) with a unique capacity to use your core skills and competences to provide meaningful answers to the concerns of the specific times (responding to demand). Whatever was achieved over the last 10 years was due to the dedication of many of you at different points in time in diverse corners of the organization and in diverse capacities. Without you ILRI would not be where it is today. It is of course difficult to do justice to all your contributions but I still want to mention some key contributors. The two persons I worked closest with were John McDermott and Bruce Scott. The long list of key contributors over the years includes Bill Thorpe, Ralph von Kaufmann, Brian Perry, Ade Freeman, Steve Staal, Shirley Tarawali, Ed Rege, Segenet Kelemu, Gabrielle Persley, Peter Ballantyne, Tom Randolph, Iain Wright, Agibou Tall, Getachew Engida, Margaret MacDonald‐Levy, Susan MacMillan, Azage Tegegne, Dirk Hoekstra; three board chairs I had the honour to serve—John Vercoe, Uwe Werblow, and Knut Hove—and the many board members that served over the years. I would also like to thank my assistants who helped me with the day‐to‐day work: Maria Mulindi, Vivian Awuor, Anne Muhato and Terry Muindi, as well as Loza Mesfin here in Addis. Thanks to all of you—ILRI staff, management and board—for an exciting decade of jointly making livestock a pathway out of poverty. Listen to an audio file of this speech by Carlos Seré. 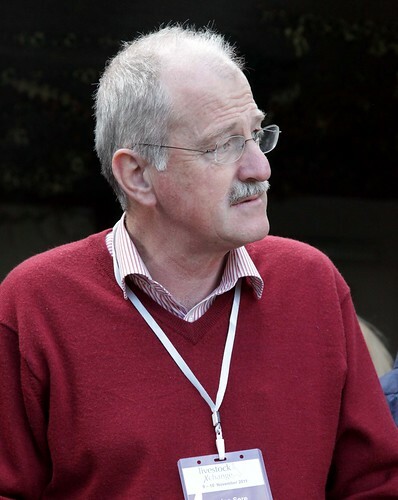 Find this transcript on ILRI’s Mahider: Livestock research for development in a complex, messy world: Reflections on a decade of work for ILRI, by Carlos Seré. For a summary of the highlights of this talk by Carlos Seré, read this earlier post on this blog: Amidst change, time to take stock of livestock science to reduce poverty, 10 Nov 2011. On 9 and 10 November 2011, the ILRI Board of Trustees hosted a 2-day ‘liveSTOCK Exchange’ to discuss and reflect on livestock research for development. The event synthesized sector and ILRI learning and helped frame future livestock research for development directions. Tags: 2011 Livestock Xchange Conference (ILRI Addis), Carlos Seré, ILCA, ILRAD, livestockX. Bookmark the permalink.